I've featured my pink and purple Clematis that grows throughout my garden but I have saved the best for last...this is my White Henryi Clematis. Nothing pleases the eye quite as much as the sight of a clematis vine in full early-summer bloom, cascading over a wall or climbing a fence. The single daisy-shaped blooms are 6 to 7 inches across, with a dark center and a creamy "crease" or two up the center of each petal. I haven't made up my mind just yet but I think this one might be my favorite. This is my favourite clematis as well. This is the third year since I first planted it and it's growth has doubled this year. I have heard that the 'Henryi' clematis reblooms in late summer. 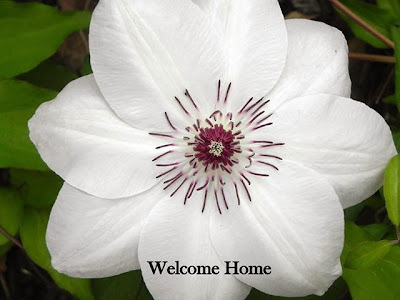 Does your clematis rebloom? I am also curious about the number of blooms that your clematis achieves each year? Do you fertilize your clematis?